Students are encouraged to apply as early as possible. Applications will be accepted after February 1 if space is available. For more information, contact Bernadette Holthuis. 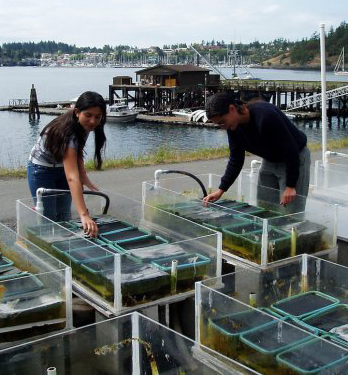 In addition to two quarter-long programs, UW will be offering a one weekend, one credit course for undergraduates at Friday Harbor Laboratories: Introduction to Marine Biology in the San Juan Islands at Friday Harbor Laboratories for undergraduates (2 days, 1 night, May 4-5, 2019). There are no FHL apprenticeships scheduled for Spring, 2019. The next one will be offered in Autumn 2019: Pelagic Ecosystem Function in the San Juan Archipelago. Research apprenticeships vary each year but are always scheduled in either spring, autumn or both, but are NOT offered in summer. Students should plan to arrive Sunday, March 31 after 3:00 p.m.
Students should plan to depart anytime after 5:00 p.m. on Friday, June 7 but no later than Saturday, June 8 after breakfast. First meal for students is dinner served on Sunday, March 31, 6:00-6:30 p.m.
Last meal for students is breakfast served on Saturday, June 7, 7:45-8:15 a.m.
Spring Marine Studies and the Zoo-Bot Program run a full academic quarter (10 weeks) and are targeted to undergraduates and post-baccalaureates. Spring classes require a full-time commitment and are held Monday-Friday 8:30 am-5:00 pm. Credits for FHL coursework will be earned through the University of Washington. Both UW and non-UW students can receive credit. Students must apply and be accepted by FHL before they can register for Spring Marine Studies (SMS) or the Zoo-Bot Program. There are different registration procedures for University of Washington (UW) students and non-UW students. FHL staff will provide Add Codes to UW students so students can register themselves through MyUW. All non-UW students will be registered by FHL staff. Priority given to University of Washington Freshmen and Sophomore Marine Biology Majors and Minors. Would you like to spend your summer at FHL on a Summer Internship? Or perhaps you would like to conduct your own research? Students are welcomed to FHL in several capacities. Your class can also visit FHL on a field trip!